The Atlantic Division bracket featuring three of the top seven teams in the NHL makes for a brutal path to the Eastern Conference final. Familiar foe: Boston expecting yet another tough series in its latest postseason matchup with Toronto. Tampa Bay Lightning earned record-tying 62nd win in season finale. 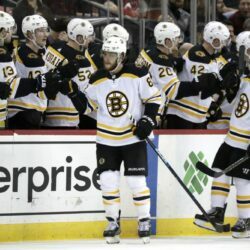 Goalie notches his fifth shutout of the season and 47th of his career, and short-handed Boston beat Minnesota 3-0. 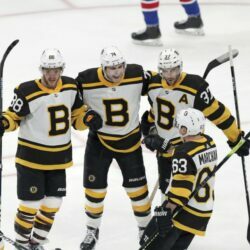 Brad Marchand becomes 10th Boston player to reach 100 points. Evgenii Dadonov scores twice in Florida's 4-1 win over Boston. 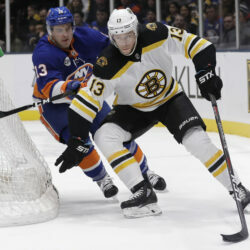 Pastrnak had three goals and two assists for a career-high five points, sending the Boston Bruins to a 6-3 victory over the New York Rangers. 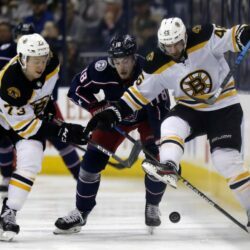 Patrice Bergeron scored twice and reached the 30-goal mark for the fifth time as streaking Boston beat the injury-ravaged New Jersey to open a six-point lead over Toronto in the race for second place in Atlantic Division.